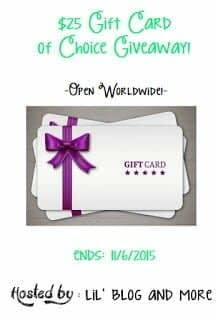 Welcome to the $25 Gift Card of Choice Giveaway! Need a $25 Gift Card? Enter giveaway below and you can win your choice of Gift Card! name will be announced on the Giveaway Tools form. I’d love a gift card to Home Depot. Thanks so much. I would pick a Amazon. I would choose a Paypal transfer. I want a Walgreens gift card! I would choose Amazon, and I would save it for a Xmas gift. If I won, I’d choose an Amazon gift card. I would choose to receive Paypal cash. either walmart for groceries, target for baby needs or paypal for Christmas gifts! Thanks for the chance! Hard choice but Walmart or Paypal.